Locally owned and operated, as Parksville Dolphin Travel 2008 Inc, we are an associate of Carlson Wagonlit Travel, with over 165 offices coast to coast. 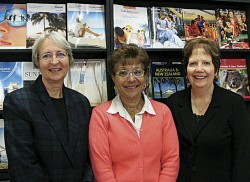 Parksville Dolphin Travel are experienced and friendly travel professionals. We can give you insight into many destinations through our own extensive travel experience, and offer tour and land packages, cruises, hotel and air bookings, as well as travel insurance. Let us take the stress out of planning your next vacation. Around the world, or closer to home, we are here to assist with all your travel needs.